Let’s be honest – even the New Age has a business sector. Why is it that some Lightworkers thrive no matter the business climate, and others fall by the wayside no matter how good they are? 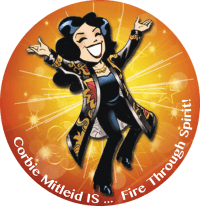 Corbie has taken her full-time career from zero to cosmic with an international following in a decade, and is ready to help you turbocharge your own business venture. Just starting to dream? Join Corbie for a Brainstorm Your New Age Business Consultation. In this 90-minute intensive, Corbie helps you come up with the name, the branding, and the core of your business vision, and shares her take on marketing, client relations, money sanity and everything that makes the difference between surviving and thriving in today’s economy. Even if your business is only a dream right now, this is the consultation for making it a reality! (It is recommended, but not required, that you have done the Create Your Sentence of Passion Consultation previously). Brainstorm Your New Age Business Consultations run 90 minutes, with a short General Reading included in the wrap-up. After your initial intensive, Corbie is available for monthly coaching sessions; ask about the package that is right for you. These consultations are available via phone or SKYPE.